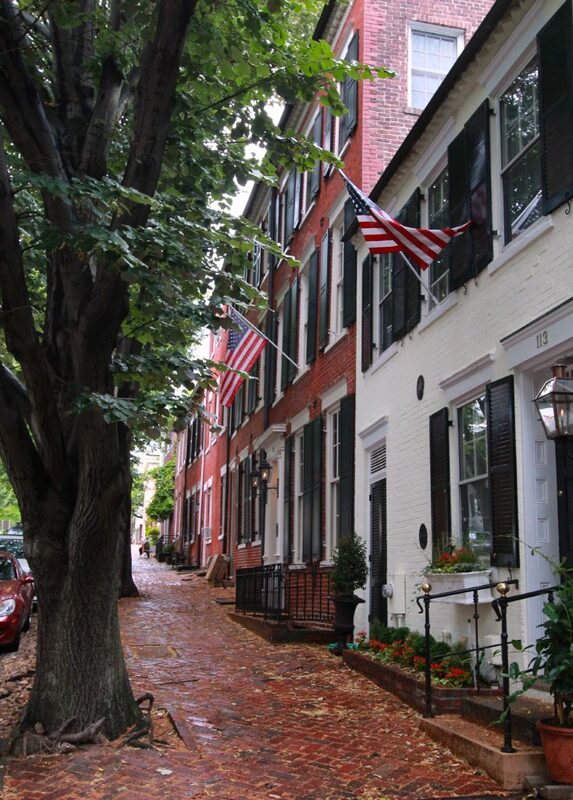 For some time now, Alexandria, Virginia has been one of my favorite destinations in the United States. Located on the western bank of the Potomac River, the city is just a short drive or train ride to the hustle and bustle of Washington, D.C.
From the art galleries, boutiques, restaurants and antique shops of it’s historic center, “Old Town” to the cobblestone streets lined with 18th and 19th century architecture – complete with gas lanterns and American flags – Alexandria is one of those special places that will steal your heart. Unlike all my previous stays in Alexandria (which revolved around work in D.C.) this trip with Holiday Inn put Alexandria front and center as I set out to get better acquainted with the man we refer to as the father of our country. 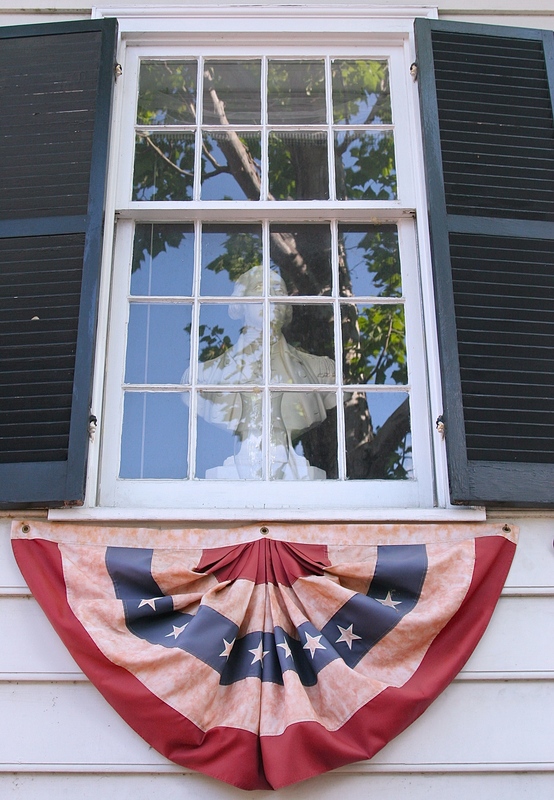 With the Fourth of July just around the corner, I would like to share with you my favorite stops in Alexandria that were once a part of George Washington’s stomping grounds. 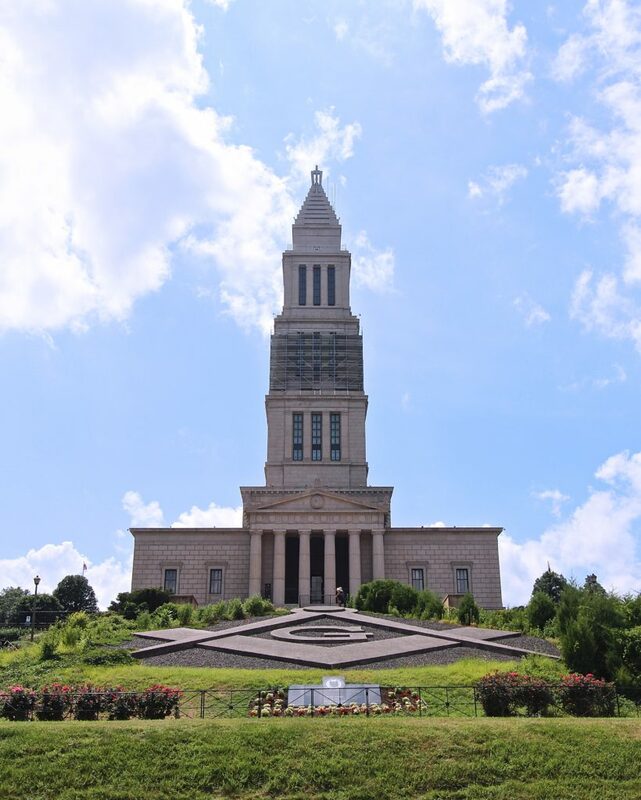 Built to honor the memory of George Washington, his role as a free mason and as a way to preserve the heritage of American Freemasonry – The George Washington Masonic National Memorial left me feeling as though I had entered a Greek or Roman temple. 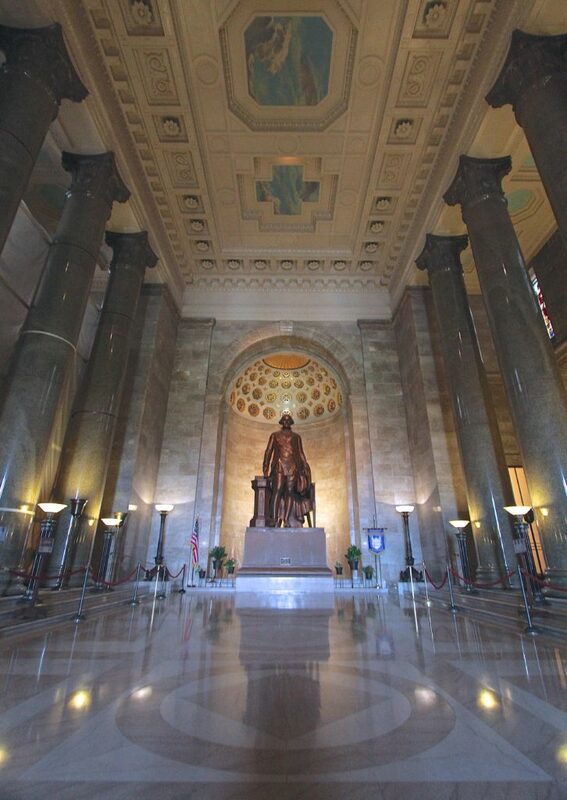 The Memorial Hall was striking with its eight large granite columns leading you down to an enormous statue of George Washington. There he stood presiding over the hall – gavel in hand while wearing his Masonic apron and jewel. I cannot stress how small I felt in this room or how drawn I was to the statue and colorful murals that lined the walls. Not far from Memorial Hall was the Replica Lodge Room – a room designed to look like Alexandria-Washington Lodge No. 22 which was once located on the 2nd floor of City Hall. This room mimics the lodge Washington used to attend and displays furniture from the original location along with artifacts that once belonged to Washington himself. From the Replica Lodge Room we made our way up to The George Washington Museum. Besides the fact the room was another jaw dropper – some of the artifacts in this room that belonged to Washington were pretty impressive. 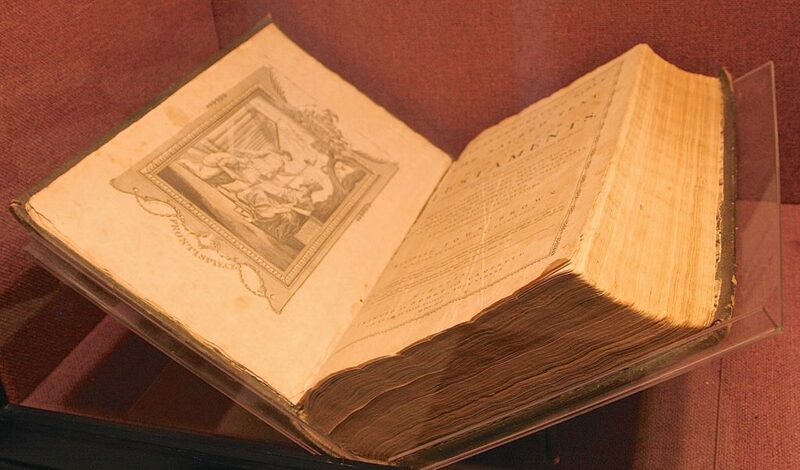 From his family bible (complete with signature) and items that traveled with him during the Revolutionary War – right down to a strand of his hair… I was wishing I had more time to look around. I would say my one and only complaint with the tour is how quickly they would move you through each area. 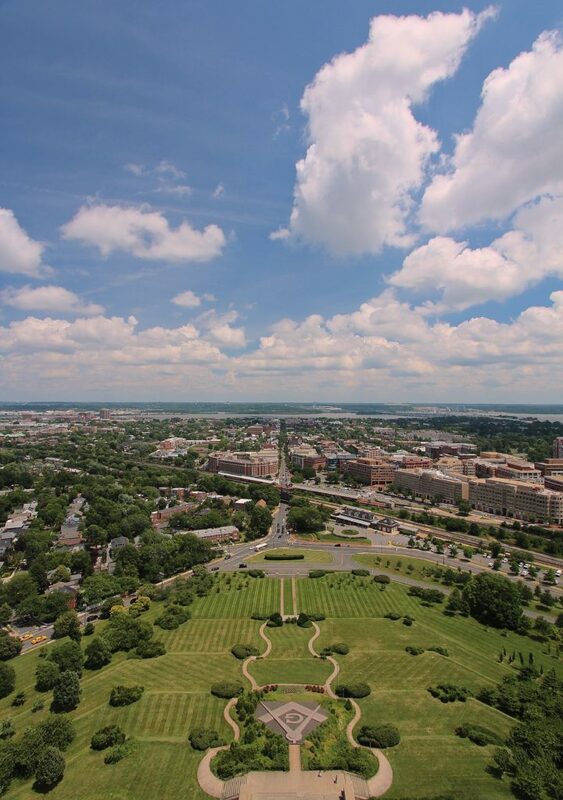 Last stop at The George Washington Masonic National Memorial was the Observation Deck. The view from the top was absolutely beautiful – I could not have asked for better weather. Not only could I see all of Alexandria, it was easy to spot the Capital Building and the Washington Monument in nearby D.C.! Located at 508 Cameron Street, wedged between two larger buildings, stands a replica of George Washington’s modest home away from home. 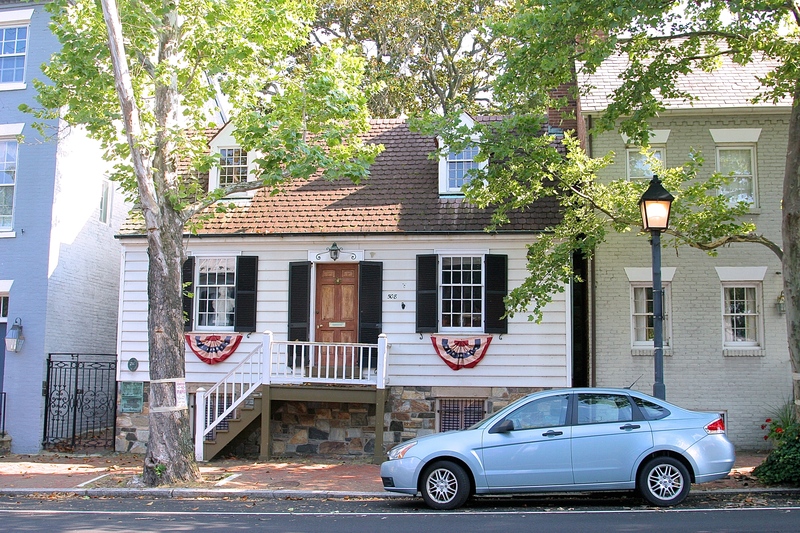 The original townhouse – designed, built and completed by Washington in 1796 – was used by George and Martha as an office and as a place to stay when visiting Alexandria for both business and social events. After falling into disrepair in 1855, the residence was demolished and the lot was turned into a garden. Later in 1960, lot owners Gov. 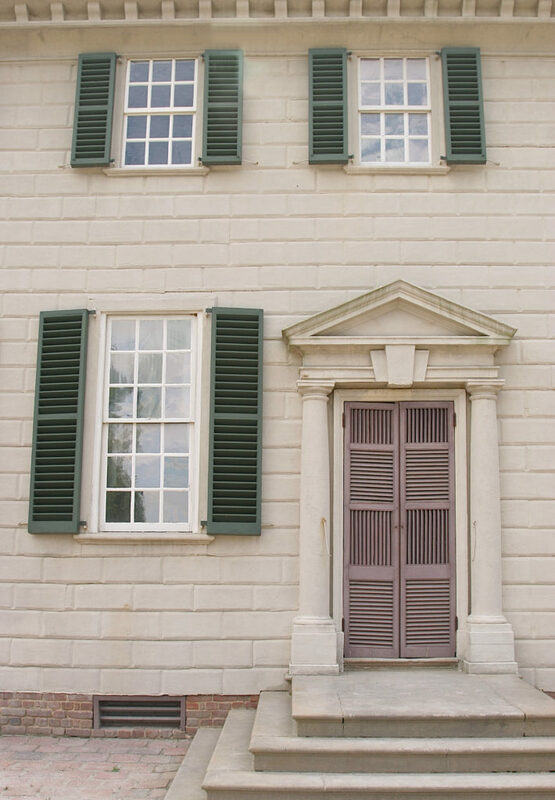 and Mrs. Richard Lowe built a replica of Washington’s former townhouse based on rough sketches drawn by a neighbor. The structure was built on the original foundation using bricks and stones evacuated from the site. Over the years, the property has had several owners but remains a private home and is known as Alexandria’s only replica of a historic building. Although it’s only a replica, I enjoyed this stop quite a bit. The first thing that struck me was how small the home was – it wasn’t the grand property you’d expect to be associated with a president. 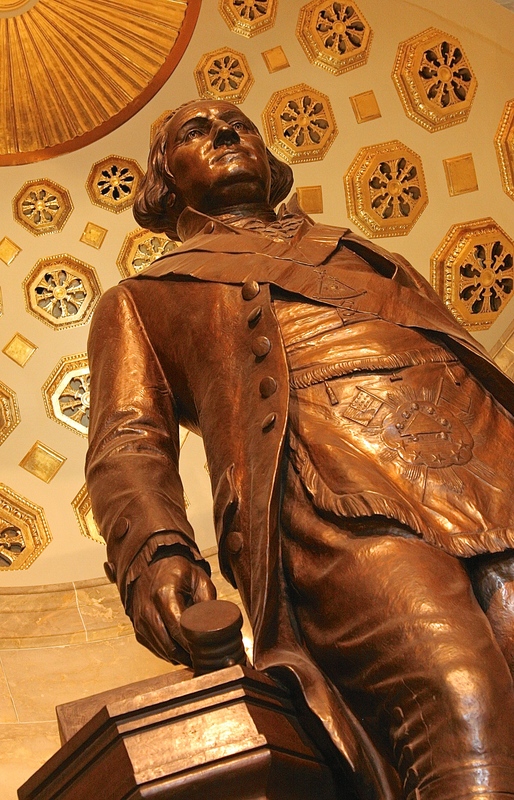 To me, George Washington has always been this larger than life character – the Commander-in-Chief of the Continental Army, a Revolutionary War hero, the first United States president and the father of our country. While I knew he had Mount Vernon as his main home, the idea of such a successful historical figure staying in this humble little home put a smile on my face. For some reason, I found it easier to connect to him. Beyond its size, it was fun to watch as many others stopped to have a look. Like me, they commented on the structures size and laughed when they spotted the plaster bust of George Washington peaking from the first floor window. Located at the corner of N. Washington Street and Cameron Street, its hard to believe this little church was once referred to as, “The Church in the Woods”. 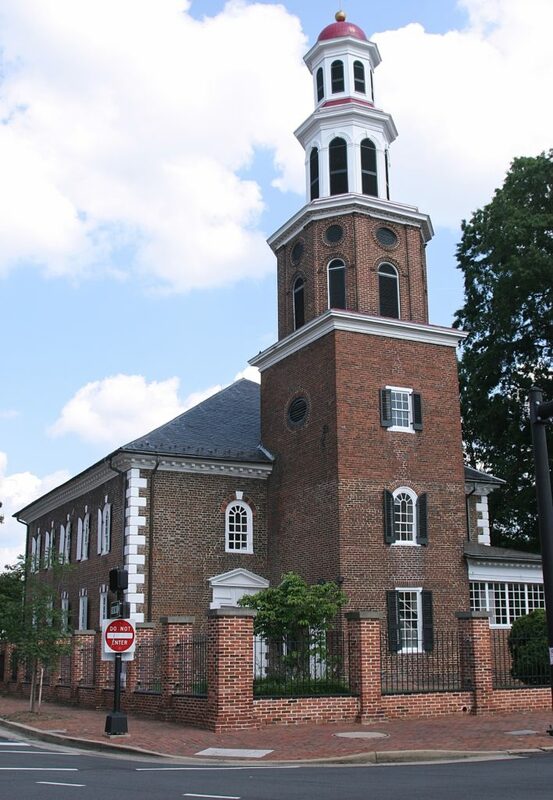 While the town of Alexandria has changed significantly since Washington’s time – Christ Church has not. That’s not to say there hasn’t been additions, modifications or restoration efforts since it was completed in 1773 – they have just been minimal enough that you’re still able to see what Washington saw when he attended. 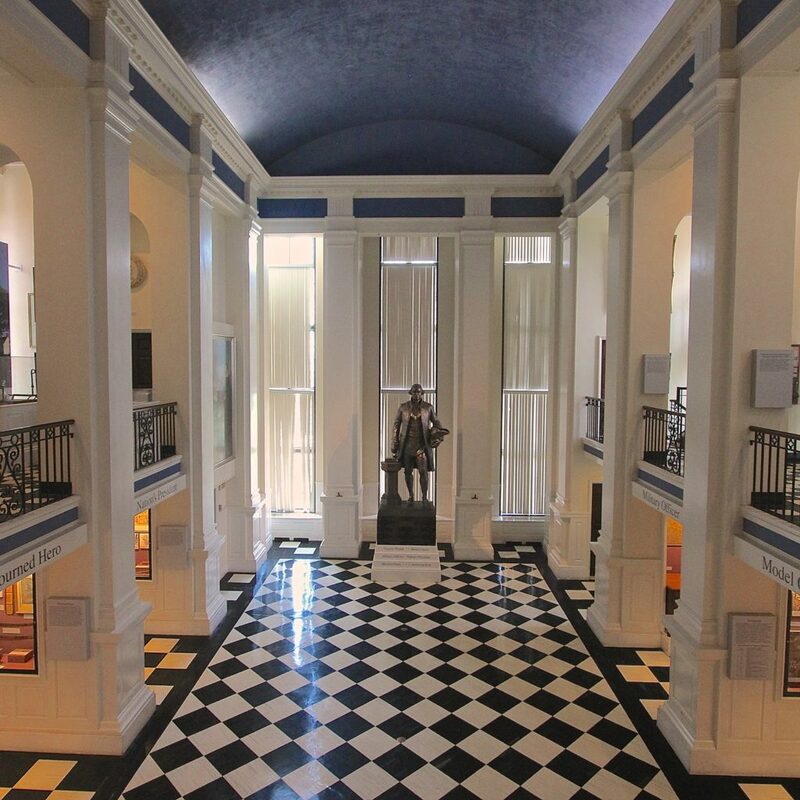 The biggest changes made over the years have been the addition of balcony seating with support columns, the replica wine glass podium, the silver candelabras and two memorial plaques – one for George Washington and the other for another famous attendee, Robert E. Lee. Whenever Washington stayed at his Cameron Street townhouse for business or social events, he would attend Christ Church with his family. 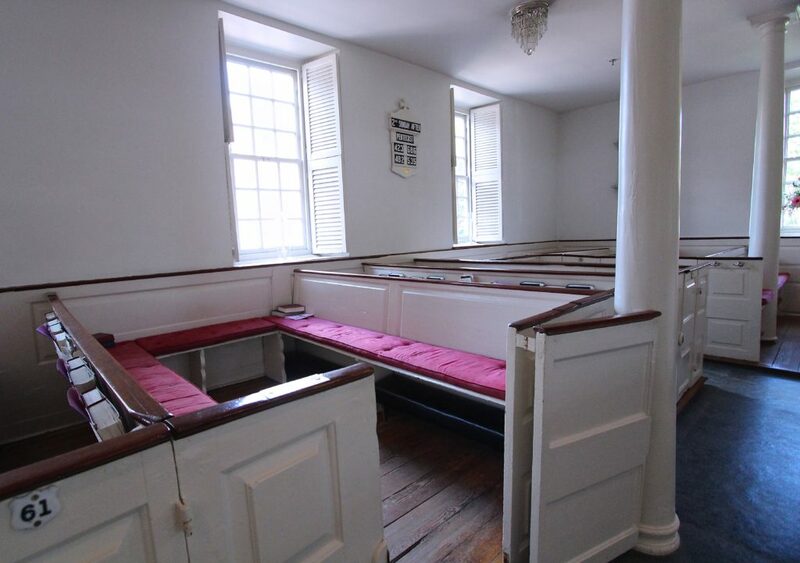 Funny enough (in those times) it was common for attendees to buy or rent box pews. When I heard this, I immediately thought of someone buying box seats at a baseball stadium. …Entertainment has certainly changed over the years. 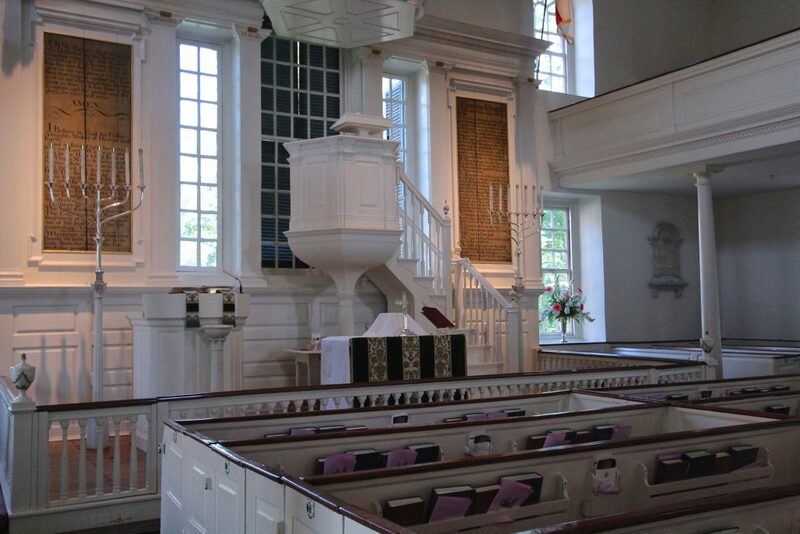 As much as I loved this stop as a whole, I think the highlight of my visit was getting to sit in the pew that was once owned by Washington himself. Yes, it is still there! I will never get over opportunities like this and am so grateful historical structures like Christ Church are still standing. 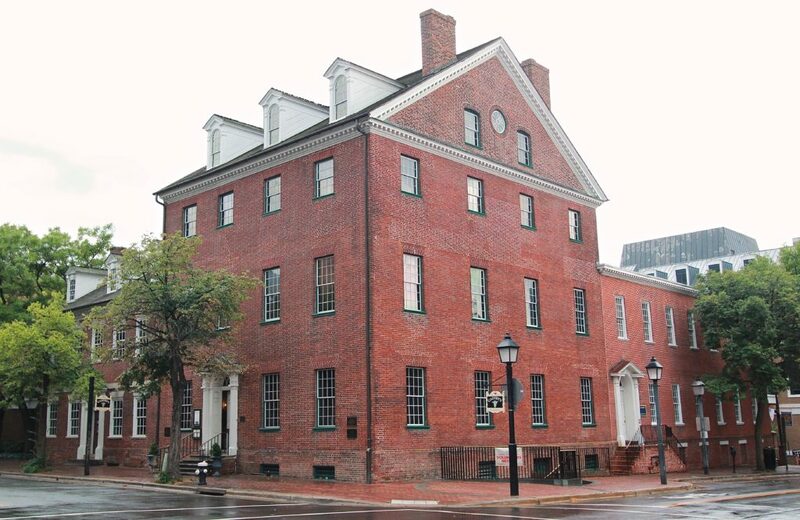 Built in the late 1700’s the Gadsby’s Tavern consisted of two buildings – a tavern and hotel. 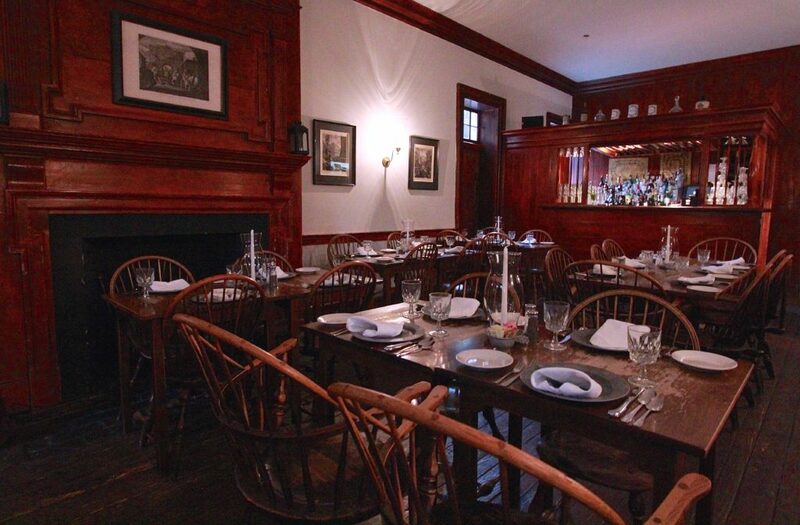 Operated by John Gadsby from 1796 – 1808, Gadsby’s Tavern was the place to go in Alexandria for fine dinning, drinks (including the tavern’s famous – rum punch), social events and meetings, as well as a place to crash for the night. 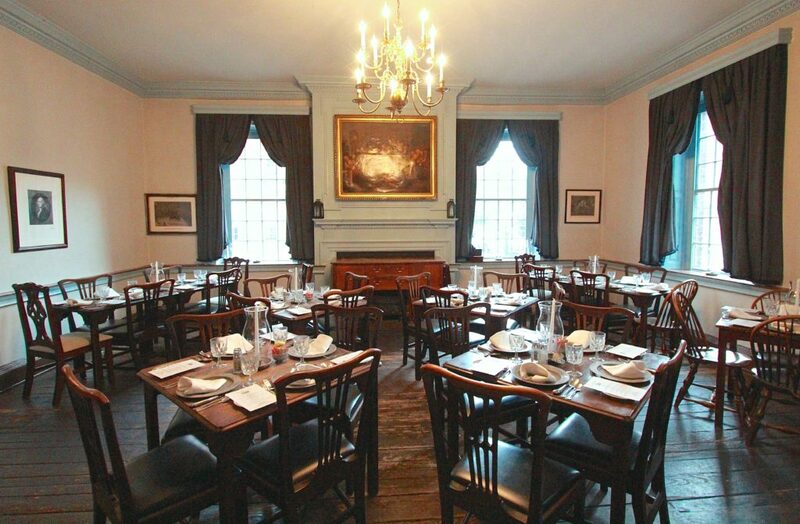 George Washington was not only known for eating here – he and Martha Washington also attended two birthday celebrations that were held in his honor. Today the two buildings function as a museum and a restaurant, serving lunch and dinner daily, along with Sunday brunch. On one of my nights in town, I stopped into Gadsby’s for dinner and absolutely loved it. The first room I walked into had more of the tavern feel – a lot of worn woodwork, a fireplace and a full bar. Just off this first room were two other dinning spaces with a completely different feel – more formal. The chairs and tables were a little more decorative (but still worn) and the walls were an off white with a light blue trim and crown molding. The room was decorated with curtains, a painting and other framed drawings. One of the best parts were the server’s uniforms – they looked like they jumped right out of the late 1700’s with their high stockings, cropped pants, vests, shirts and aprons. 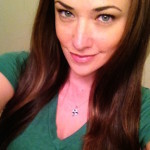 I spent most of my meal admiring my surroundings while grinning like a total nerd. 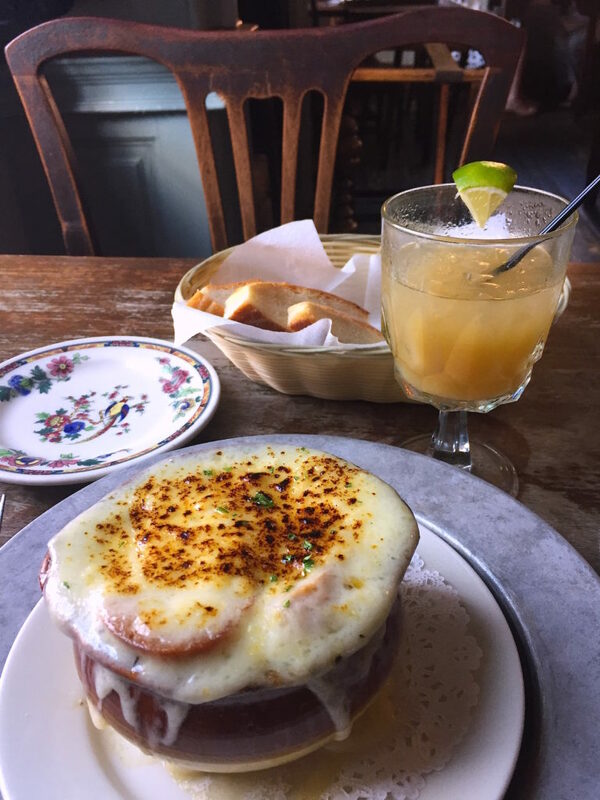 For dinner, I started with a French Onion Soup with bread and a glass of the tavern’s specialty – rum punch. After all – how could I say no to a drink they’ve been serving since the late 1700’s? 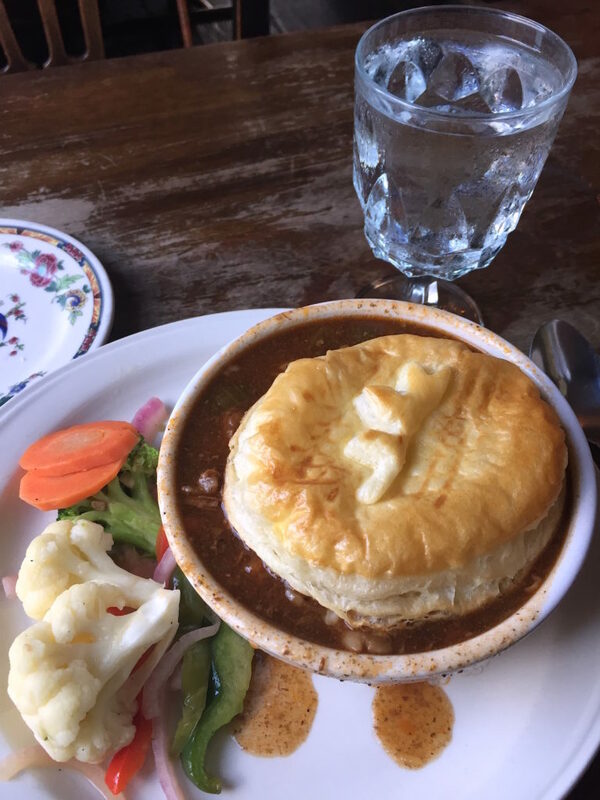 Following the soup, I went for the Gentleman’s Pye… described by the tavern as, “a colonial favorite – tender cuts of lamb and beef in a savory red wine stew topped with mashed red potatoes and a puff pastry crust”. The entire experience was fantastic in both food and atmosphere. The last stop on my trip brought me to Mount Vernon – Washington’s plantation home just south of Alexandria. The estate, which sits on the banks of the Potomac River, originally belonged to George’s father, Augustine. Following Augustine’s death, the home was left to George’s half-brother Lawrence Washington. Lawrence renamed the property Mount Vernon and following his death – the property eventually made it’s way into George’s ownership. 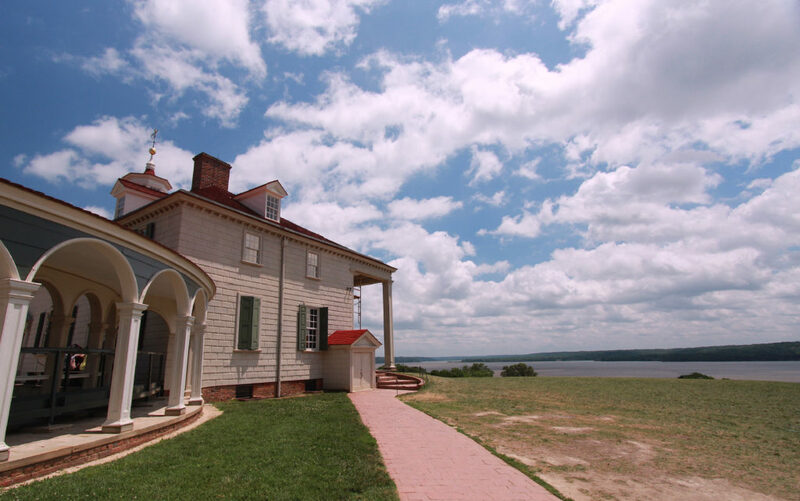 Today, the property is operated as a museum by the Mount Vernon Ladies’ Association – who rely entirely on private donations and admission sales to keep Mount Vernon running. With admission you are free to explore the grounds, which include: the mansion, blacksmith shop, slave quarters, pioneer farm, gardens, wharf, slave memorial and burial ground, Washington’s tomb, museum and education center. Of all the stops, my favorite was the guided tour through the mansion, which was decorated to look as it did in 1799 (the year of Washington’s death). It was amazing to be able to walk through a property that old, to see it so well preserved and to get a feel for how Washington lived. The rooms in the house were beautiful – some were very ornate with high ceilings, green walls, marble fireplaces and large crown molding, while others fell more on the simple side for daily or private use. 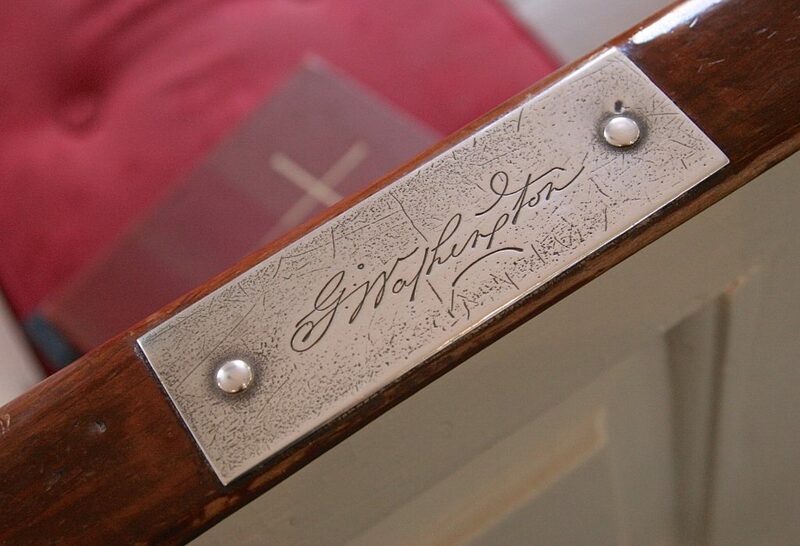 Of all the items in the home, I really enjoyed one of Washington’s prized possessions. Hung on the wall of the first floor landing or entry is a case made by Washington that displays a one pound, three ounce, wrought iron key. The key – which belonged to the Bastille – was sent to Washington by Marquis de Lafayette as a gift. On December 14, 1799 George Washington passed away at the age of 67 in his home from a short illness that started with a sore throat. 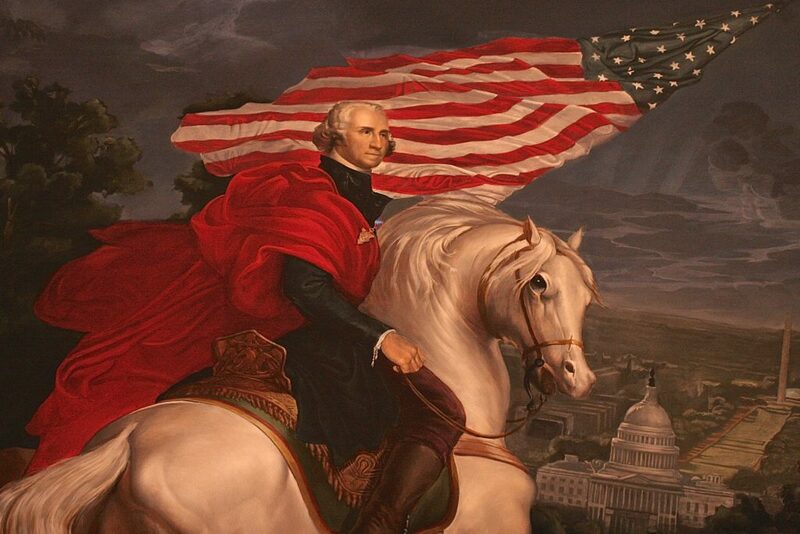 His funeral was held on December 18th where he was interred in a family crypt at Mount Vernon. 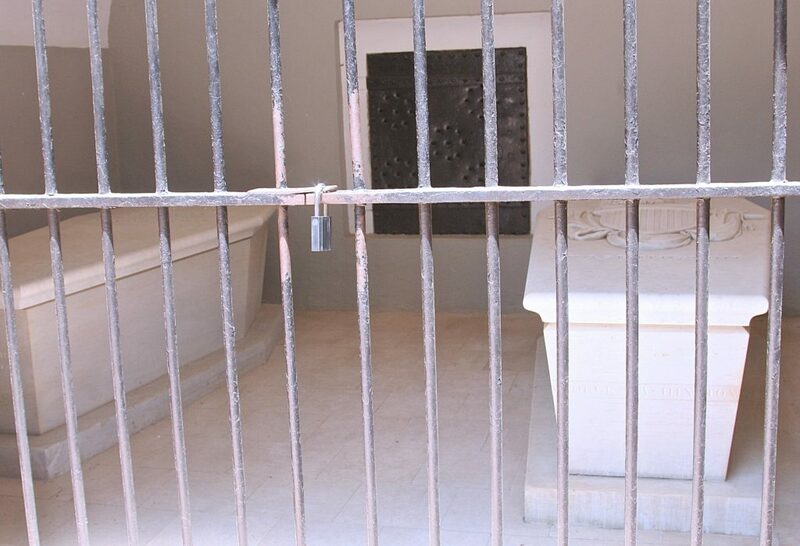 As the crypt began to fall into disrepair and an unsuccessful attempt was made to steal Washington’s skull – plans were made to move his remains. 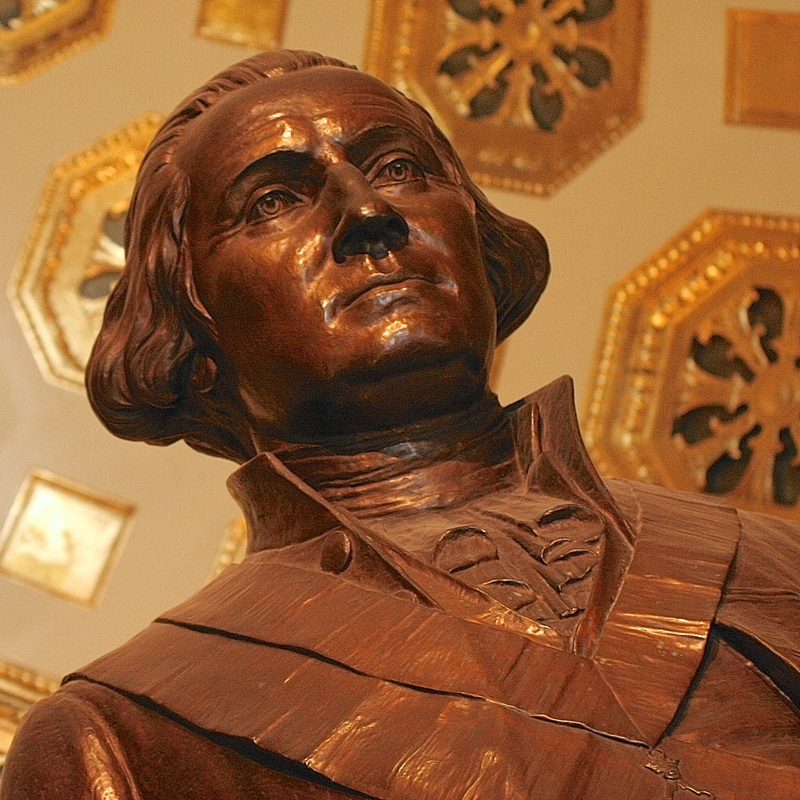 While attempts were made by some to move Washington’s body to the Capitol, Southerns fought hard to keep him where they felt he belonged – in the south. 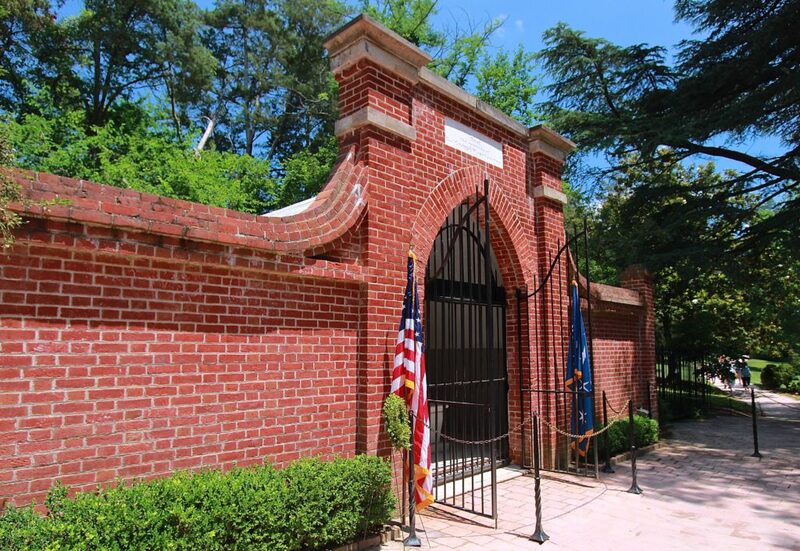 Eventually – on October 7, 1837 – both Washington and his wife Martha were moved to the new tomb on the grounds of Mount Vernon. After spending the weekend in Alexandria walking in George Washington’s footsteps, I was surprised by many things. It blew my mind that so many buildings from his time are still standing. Being able to walk down the same streets and see some of the same sights Washington would have was such a surreal experience. Also, to learn that he prided himself as a farmer first and foremost and questioned his own capabilities as a leader in the Revolutionary War went against every heroic, patriotic image I grew up with. To know a man who is still so loved and admired had his own self-doubts helped me see past the legend and straight to the man himself. I want to thank Holiday Inn for giving me the opportunity to get better acquainted with the first president and father of our country, George Washington. Yeah, though it does tend to lose its effectiveness after the second or third time, so you’ll have to pick your spots! Please continue these journeys. Your writing skills add to your many talents. I feel like I’m right there with you. Good job! Hi Kris, thanks for the wonderful write up & pictures. Makes me fee like I have travel back in time! Makes me want to visit all those places that you have mentioned. Keep them coming. Fascinating. You are such a lucky girl to have a job like this. I want to thank you for taking us on a tour of the most wonderful historic places. I really appreciate it. Maybe one day will come when I can make this same trip.